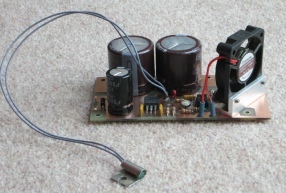 This uses the components from a power supply originally made by one of our local club members many years ago and my task was to rebuild it to fit into an SB-600 case. This has been a significant challenge as it was never intended to fit into such a small case and the largest of the three mains transformers only just fits within the height of the SB-600 so some lateral thinking was required. You can see the scale of the challenge from the photo on the right of the major components. 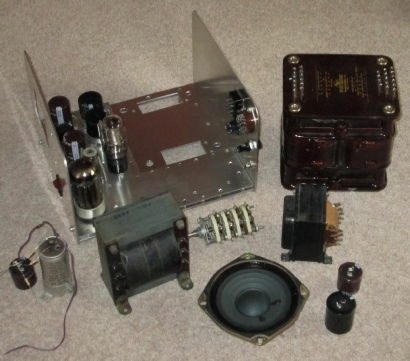 All of the original electrolytic capacitors were put on a reforming jig and failed due to excessive leakage current after several hours - one showed 12mA at 450V - so they were discarded and new items procured. All of the functions are now wired and working but the view on the right excludes the fan controller. The complete assembly just fits into the SB600 case but the three mains transformers make it very heavy. 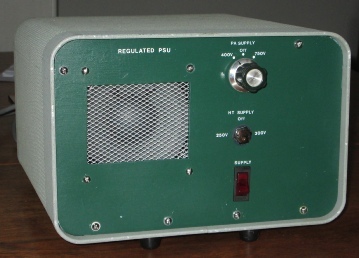 The 250/300V supply is regulated with a 6080 (6AS7). 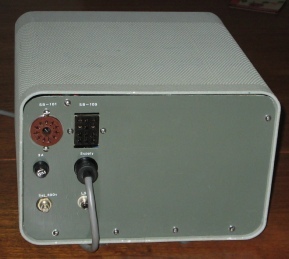 The rear panel contains the 3 pin mains connector, 11 pin octal socket, mains fuse and utility output socket. The valve regulator circuit may be seen here. The module on the right holds two 450v electrolytic capacitors for which there was no room on the main chassis, a small fan to direct cool air over the 6080/6AS7 and a simple fan controller driven by a home made temperature sensor based on an NTC thermistor in a metal mounting clip. The controller and fan are powered from a 12v DC supply derived from a 12.6v heater winding and uses a CMOS op-amp configured as a comparator schmidt trigger driving a 500mW NPN transistor that in turn drives the fan. This assembly mounts on the spacers behind the loudspeaker that are just visible in the photo above the controller. 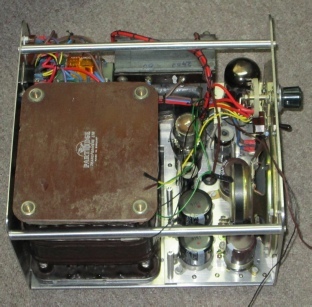 The PSU is shown below, viewed from the left and right hand sides respectively, with just the panel painting and lettering to be completed and the loud speaker wired up. The unit has been soak tested with the thermostatically controlled fan cycling on and off every few minutes.